6:00 a.m.: Spahr hits snooze on his alarm. Repeats three times. 6:25 a.m.: Checks weather app and tide charts while coffee brews. 6:40 a.m.: Stops by gas station for another cup of coffee on the way to the boat landing. Runs into three oystermen on their day off; hires them to help him wash oysters that afternoon. 7:00 a.m.: Puts boat in water at the Cape Romain National Wildlife Refuge. 7:15 a.m.: Rounding a bend into Sewee Bay, spots two bald eagles perched on DNR signs. 7:25 a.m.: An adolescent dolphin followed closely by its mother beelines playfully towards the boat and dives beneath it. 7:30 a.m.: Drives the boat onto a harvested shell bank to spread new shell for future growth. 8:15 a.m.: Marks the harvest start time on paperwork (for DHEC compliance), then starts harvesting singles. 8:45 a.m.: A curious willet arrives and stakes its claim, fighting off competitors for rights to any oyster scraps. 9:30 a.m.: Continues harvesting, tapping apart clusters with a crowbar of choice and wedging market singles loose. 10:45 a.m.: Switching beds, Spahr boats past a fisherman casting for whiting in a deep fishing hole; they wave. 10:50 a.m.: Checks in with his crew by phone. 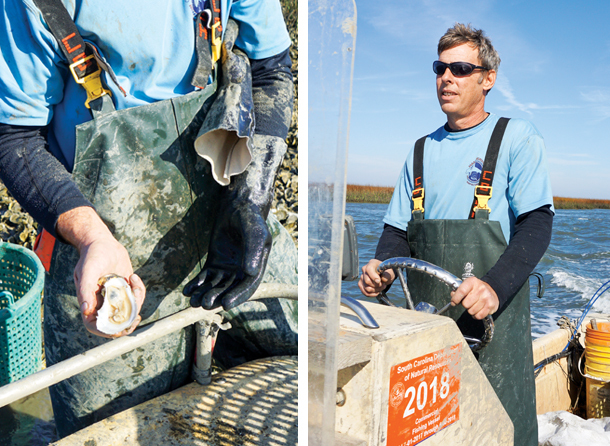 Each oysterman works his own intertidal bank within the 950 acres of marsh that Spahr leases. 11:45 a.m.: The rolling wake of a passing boat reveals an alligator lurking just beneath the tide line 30 yards away. Spahr switches locations. 12:30 p.m.: Spahr is so focused on work, he forgets to eat the lunch his wife packed for him. 1:30 p.m.: Calls his fellow harvesters for a count. Together they have collected 1,400 singles and knocked free more than 3,000 smaller oysters to continue to grow for future harvests. 1:45 p.m.: Boating to the mainland, Spahr reminds himself he is lucky to call this his daily commute. 2:00 p.m.: Presents paperwork to DHEC and DNR officers patrolling the landing. Both agencies spot-check boats to make sure oysters are being handled properly. 2:30 p.m.: Washes the oysters while running them through a custom tumbler. 3:30 p.m.: Loose shell and small seed oysters that broke free in the tumbler are re-crated to re-seed oyster beds on the next outing. 4:00 p.m.: Calls restaurants to confirm orders and schedule deliveries. 5:00 p.m.: Goes home and gets tackled by both of his boys; plays with them until dinnertime. 8:00 p.m.: Checks weather and tides before bed. To read the rest of our guide to Lowcountry oysters—including introductions to a variety of locally cultivated singles, a primer on hosting your own roast, and more—click here. For more from our February issue, click here.